On October 17-18, the 20th annual Texas Book Festival will be held in and around the State Capitol in Austin. This signature event is free to the public and celebrates authors and their contributions to the culture of literacy, ideas and imagination. 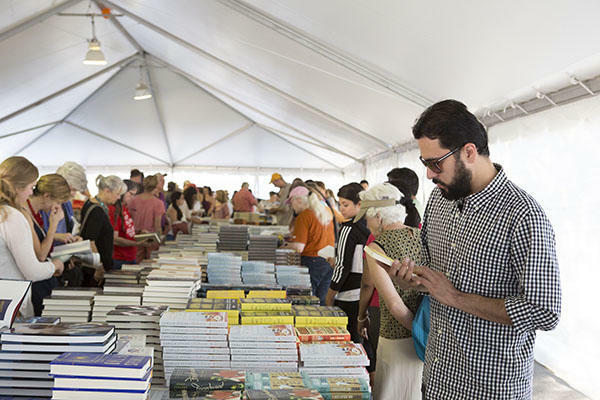 Over the years, the Texas Book Festival has evolved into one of the premier literary events in the country. More than 250 authors and 40,000 book lovers of all ages attend the festival annually. With author readings and presentations, panel discussions, book signings, a late-night Lit Crawl, cooking demonstrations, live music, local food, YA authors, children&apos;s activities and exhibiting vendors from across the state, there&apos;s something for everyone to enjoy. While remaining an important showcase for the work of Texas authors, the Texas Book Festival hosts important writers from all over the world and has earned a national reputation for the quality of its programming and its appeal to readers, authors and publishers alike. This year, Margaret Atwood, Saeed Jones, Chuck Palahniuk and Sandra Cisneros are just a few of the exciting authors on our lineup. To see them and the rest of our great authors, join us for the 20th anniversary of the Texas Book Festival!